"Rouille" is a delicious and very french sauce, that comes in as many versions as there are households. When made from bread, red grilled bell peppar, fresh chillies, garlic, egg yolk and olive oil, it is perfect to a rich fish soup and a full bodied Riesling. 2004 Riesling Grand Cru Sporen offers candied lemons, coffee and smoke on the nose. 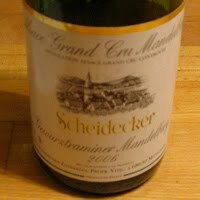 The taste is generous but still has minerality supplemented by honey, fruit salad and integrated residual sugar. A very personal XXL-Riesling that thinks that it is a Gewurztraminer. Price: € 8.